Violence has ebbed and flowed in Indian-administered Kashmir since 1989 but the region has seen a fresh wave of unrest following popular militant leader Burhan Wani's killing by Indian forces in July 2016. Gowhar Geelani reports on a small market town in the Muslim-dominated valley that has become a new flashpoint. To reach Hajin, one must drive through picturesque roads lined with poplar and Kashmir's distinctive chinar trees. But fear seems to have settled on this town in the state's northern Bandipore district, which is no stranger to violence. Situated some 40km (25 miles) from Srinagar, Hajin was infamous for being a hub of a controversial pro-India militia known as Ikhwan in the mid-1990s during an anti-India uprising. Today it has found itself in the news as it is being used as a transit route and base camp for foreign militants belonging to the outlawed Pakistan-based group Lashkar-e-Taiba (LeT). Residents of Hajin allege Indian security forces routinely carry out so-called "cordon and search operations", locally called "crackdowns", to "harass us for no fault of ours". Anti-India feelings are running high among the locals. "The army and police personnel beat us, seize our bikes and cars and ransack our houses during these operations," a local chemist told BBC while wishing to remain anonymous. "Fear of a different kind has gripped Hajin after a gap of over a decade," he said. Officials say Hajin's hilly topography allows it to be used as a safe sanctuary for foreign militants fighting Indian rule in Kashmir, and allows them to use the town as a transit route to reach central Kashmir and Indian-administered Jammu and Kashmir's summer capital, Srinagar. Most recently, on 19 November, Indian security forces said they had killed at least six LeT militants in an encounter in Hajin. An air force commando was killed and another soldier wounded in the gunfight with the foreign militants, the officials said. 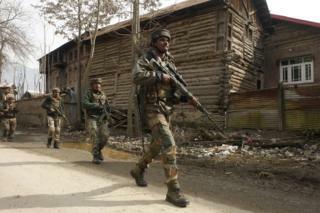 Earlier, in January, security forces claimed that they had killed a LeT commander in a gun-battle in the town. India blames Pakistan for fuelling the unrest in Kashmir and providing covering fire for militants to cross the Line of Control dividing the region, an allegation Islamabad denies. Officials say that the militants who cross over to India from Pakistan require local support and a safe place to stay until they split into smaller groups to either strike at multiple locations or regroup for a bigger attack. Inspector general of police Munir Khan denied allegations of excesses committed by forces in Hajin and said "the cordon and search operations are selective and based entirely on specific intelligence inputs". "The fear of terrorists from Pakistan is more than the fear of the men in uniform in Hajin," Mr Khan told the BBC. In the mid-1990s, Hajin earned notoriety for being the headquarters of the dreaded pro-India Ikhwan militia led by Mohammad Yusuf Parray, also known as Kuka Parray. The group was accused of kidnappings, murders, torture and extortion. Parray, a folk singer-turned-militant, surrendered to government forces in 1995, formed his own political party and became a lawmaker in the Jammu and Kashmir assembly. In 2003, suspected militants belonging to the Jaish-e-Mohammad (JeM), a Pakistan-based group whose main cause has been Kashmiri separatism, killed Parray in an ambush near the town. "First Kuka Parray harassed us to make our life hell and now the security forces are harassing us," Ghulam Parray, 60, a Hajin resident, told the BBC. "Nothing has changed for us," he said, adding that the army often accused villagers of providing food and shelter to militants. "Sometimes, when people feel stigmatised due to perceived affiliation with a particular ideology, they tend to veer to the other extreme to remove or dilute that stigma," says Shazana Andrabi, who teaches international relations in an university in Kashmir. Abdul Hamid Mir, the father of a militant who was killed, said that the people of Hajin have always felt "stigmatised and shamed by and excluded from the rest of the Kashmir valley" for being "traitors to the cause of Kashmiri independence". "But most people here never supported the pro-Indian Ikhwanis," he said. Other residents of the town say that anti-India sentiments in Hajin have also risen since the killing of separatist militant Burhan Wani, whose death last year sparked the worst violence the region has seen for years.